This week's Olancho Aid Spotlight features former high school teacher and volunteer coordinator Megan Conley. During her two years of service with the Foundation, Miss Conley was known for her organization, her sense of humor, her dedication to her students, and her leadership of the volunteer program. 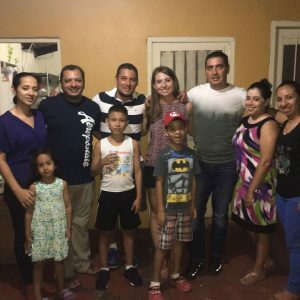 Read on to learn more about what Miss Conley's experiences at Olancho Aid meant to her. University: Texas Tech University, BA, University of Nebraska- Licoln, Ed.S. From a very good friend and former volunteer, Ms. Erin Fitzgerald! What was your role at Olancho Aid? During my first year, I taught 7th through 12th grade math. In my second year, I taught 10th through 12th grade math and served as the volunteer coordinator in the main office. Getting to know the kids, for sure! Oh yeah, and Zumba Fridays at the office! Why did you decide to extend your time with Olancho Aid? There was a lot that went into my decision to stay. I learned so much through my first year that I felt a second year could teach me even more. I also thought with a bit of experience, I could be of greater service to the Foundation as it grew. It's hard to choose just one, because there were quite a few. During both of my years in Juticalpa, I bought a cake and threw myself a birthday party at the children's home. Both years, we had a blast, and I ended up wearing more cake than I actually ate. What's the funniest thing a student has ever said in your class? What do you miss most about Honduras? Oh, everything. I loved the culture, the people, the food, even the weather! I just miss being there. I'm working towards my educational specialist degree in school psychology at the University of Nebraska Lincoln. In case you were wondering, yes, Nebraska is the opposite of Honduras. Both of my parents are teachers. As a matter of fact, I had at least one of them in class three out of four years of high school. Interested in joining the team? Contact Stephanie to learn more about current volunteer opportunities, we are seeking volunteers to begin serving in our schools this winter and spring for 4 month placements.